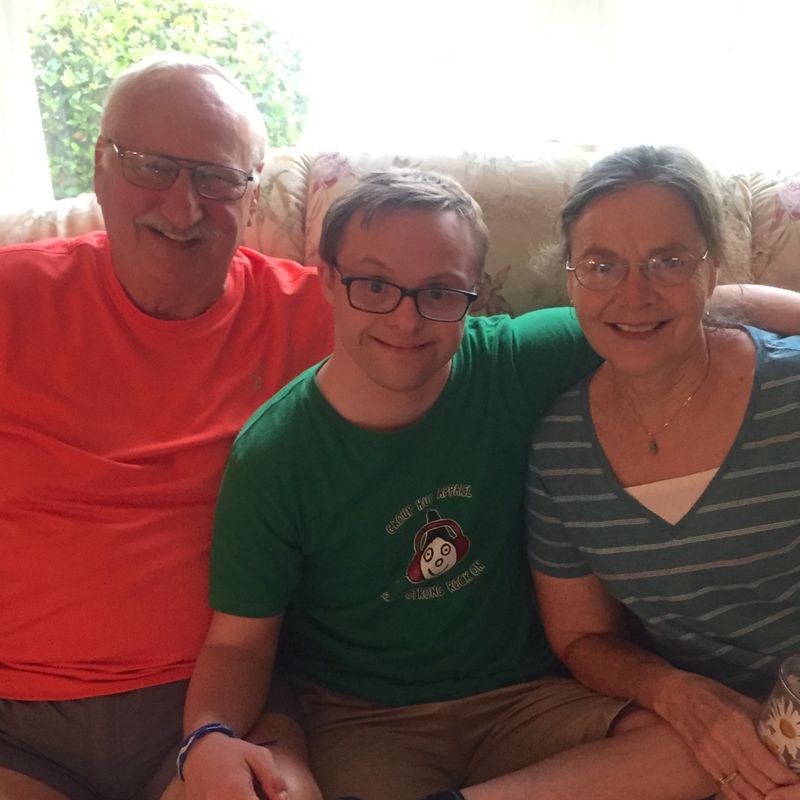 Andrew has some wonderful news to share with everyone. 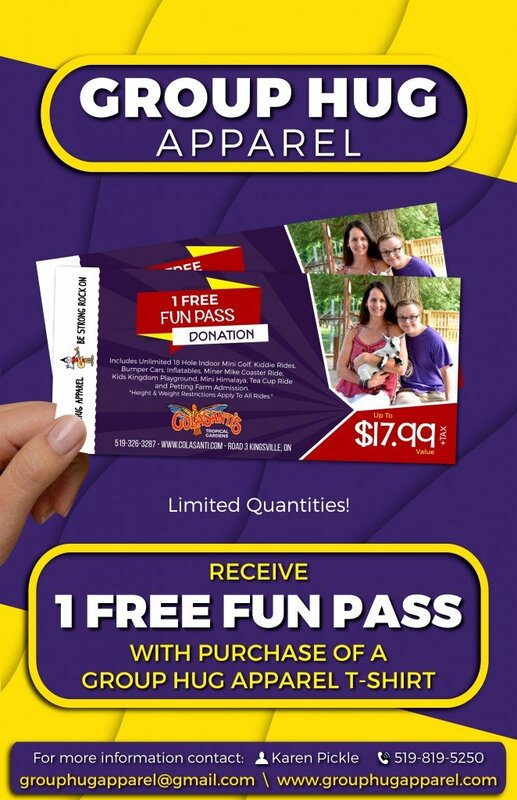 We have partnered with Colasanti’s Tropical Gardens in Kingsville ON to give away 1 Free Fun Pass with every purchase of one of Andrew’s Group Hug Apparel – Be Strong Rock On designs. How cool is this! Your fun pass Includes: Unlimited 18 Hole indoor Mini Golf, Kiddie Rides, Bumper Cars, Inflatables, Mini Himalaya, Tea Cup Ride and Petting Farm Admission. Valued up to $17.99 + tax. 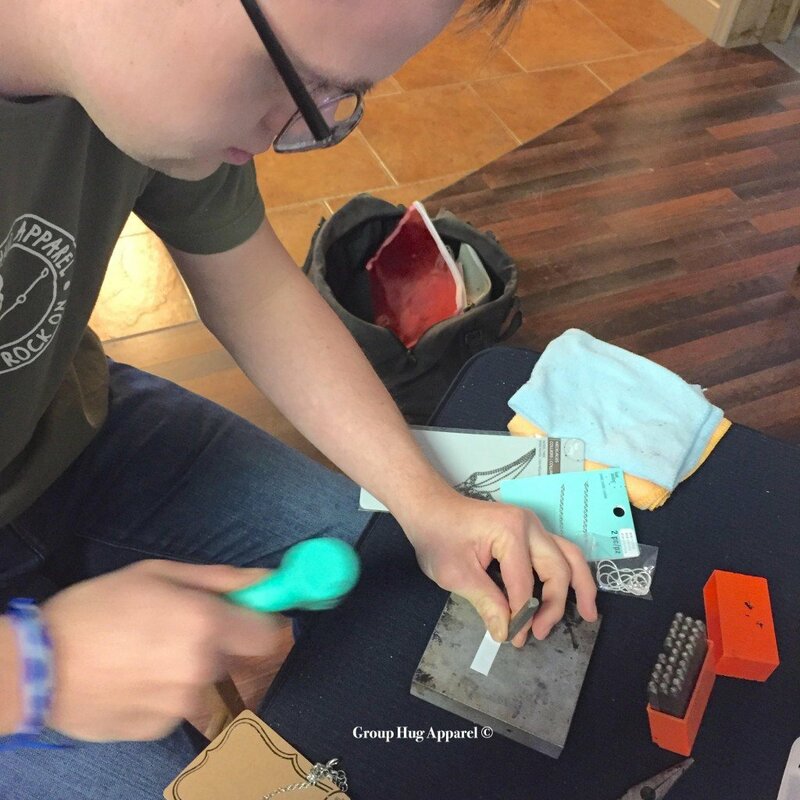 Please feel free to visit Andrew at any of his events or contact us to make arrangements to purchase a shirt and receive your FREE fun pass today. Limited quantities available so don’t miss out on this amazing offer. Thank you Colasanti’s for partnering with us on this amazing offer. It’s that time of year again for our SUMMER SALE!! Yes that’s right, it’s time to clear out some of our stock to make room for our fall inventory. So Andrew has some really awesome specials happening for 2 days only. 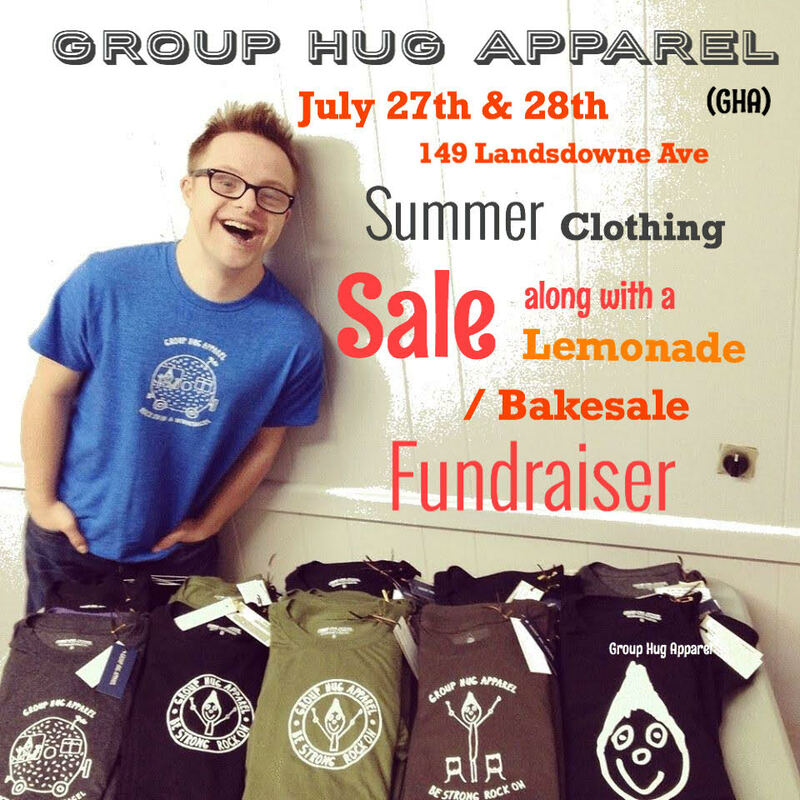 IN STORE ONLY – But not to worry if you do not live in our area and would like to get in on some of the deals please send us an email (grouphugapparel@gmail.com) to discuss further. We would be happy to ship in stock items out to you. For out of the area customers, please note that the sale ends on July 28th at 4 pm and standard shipping costs apply. 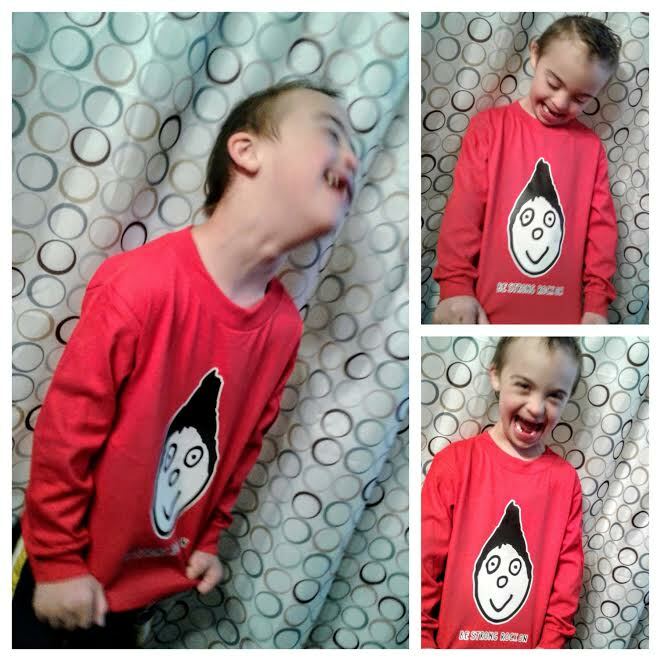 Check out how adorable Vincie Greco is wearing one of the youth long sleeved “big Head” shirts that will be on sale. BUT THE AWESOMENESS DOESN’T STOP THERE. 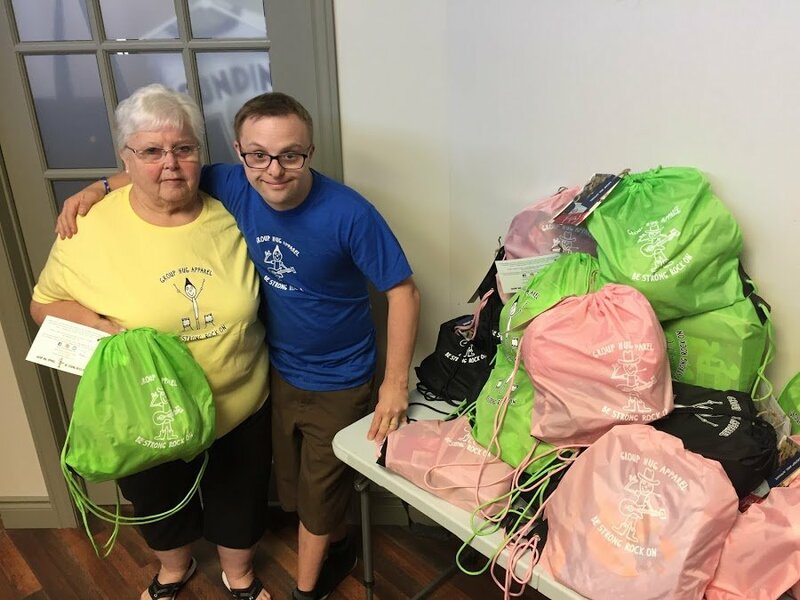 Andrew has many not for profit activities that he started like cooking classes, Hip Hop dance classes and this fall he is starting a water art classes (aqua fit). 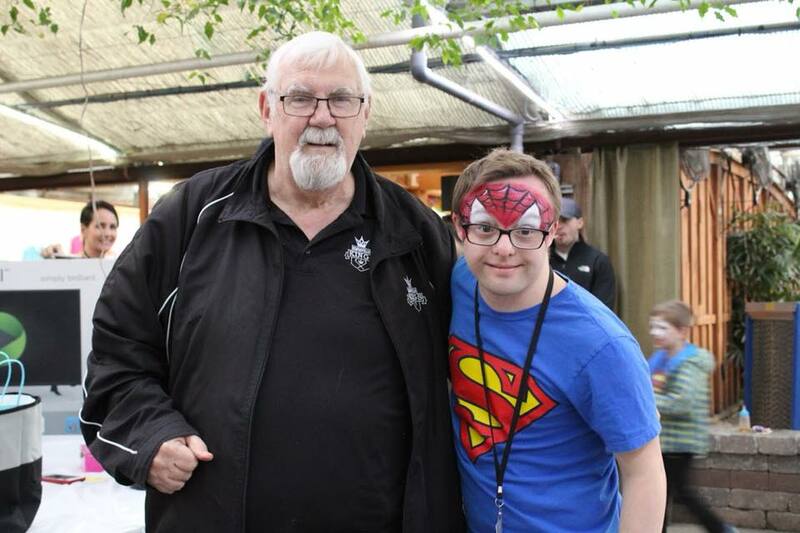 All of these activities benefit people with intellectual disabilities in our community. 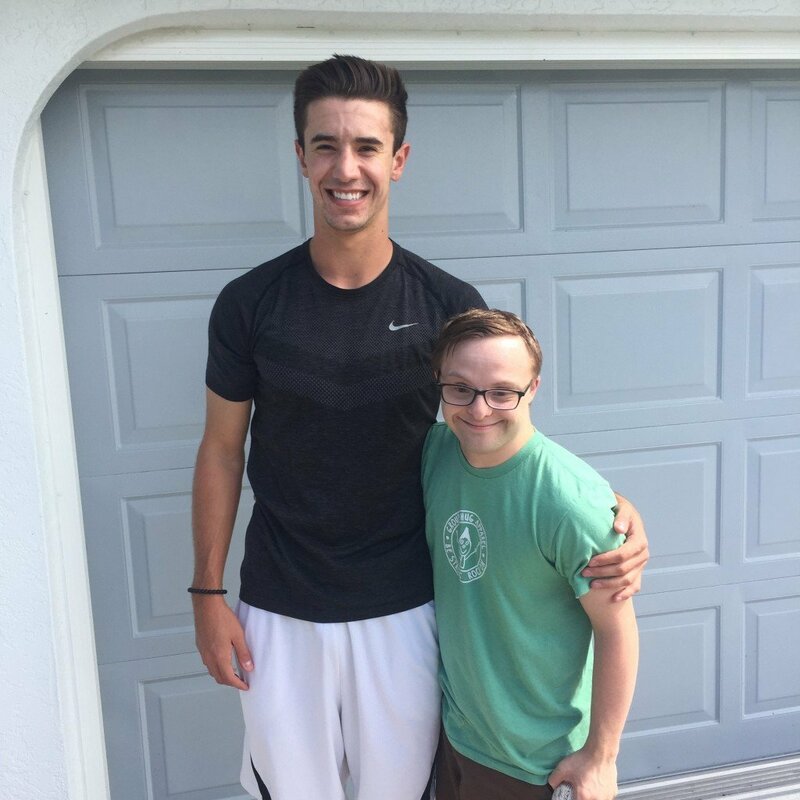 Proceeds from his Lemonade & Bake Sale will be supporting these ongoing activities. Isn’t that the coolest! 2 Awesome events, supporting 2 amazing causes. 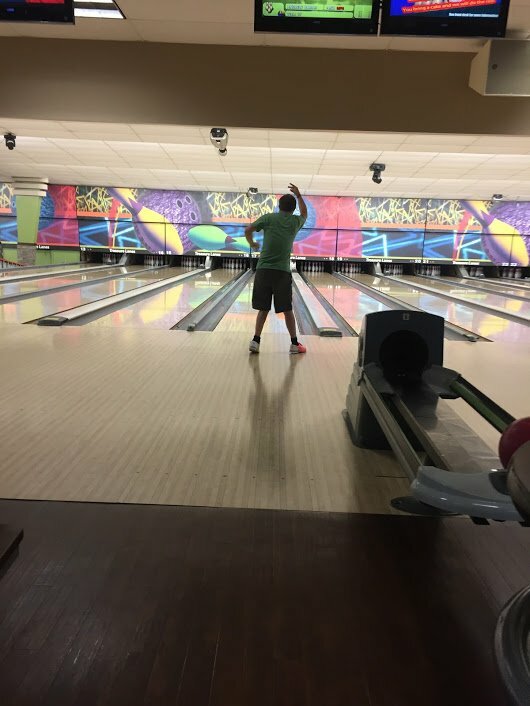 I am have fun on my vacation. 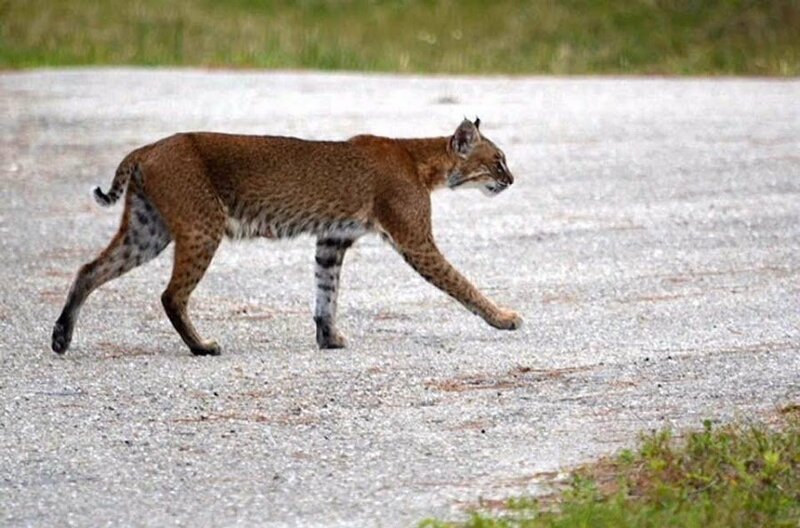 I saw turtles, funny frogs and lizards and even bobcats. 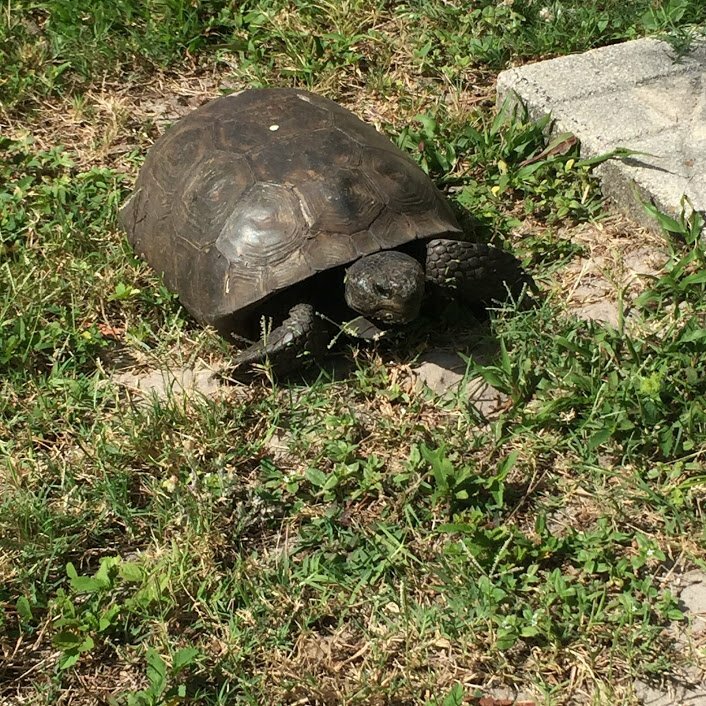 I see the turtle every time we go to my grandmas. He is old, maybe a hundred years old. Always remember to be kind to the animals. We need to help take care of them. We went to church and prayed to God. It’s important to me. I love to spend time doing this with my mom and grandma. 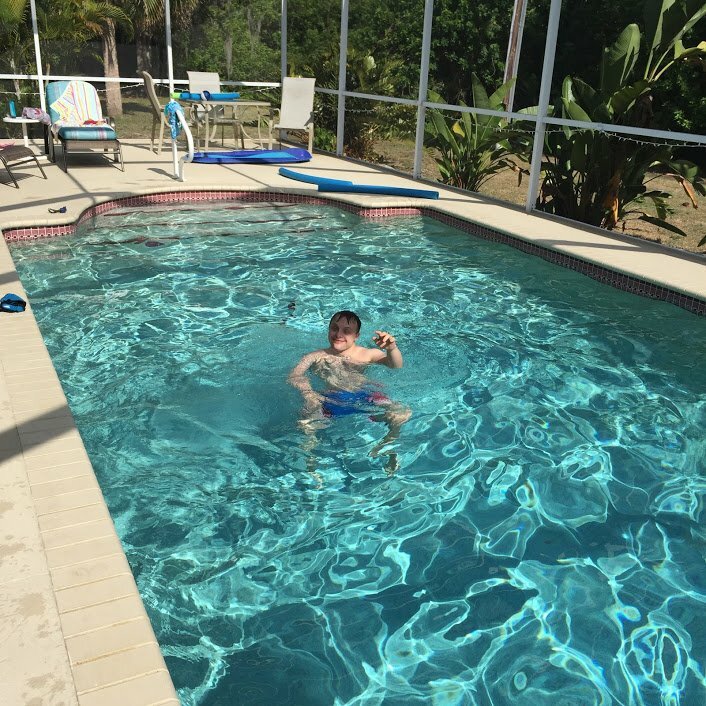 I went swimming a lot in my grandma’s pool. 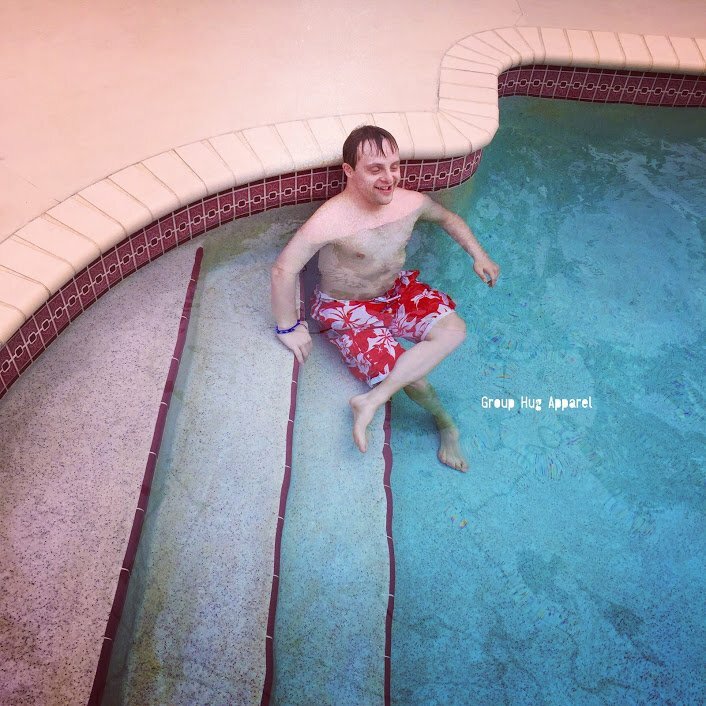 I played basket ball in the pool and floated on the floaty. I showed my mom how to do my water exercises. I learned them at water art classes every week in Leamington. Ms Debbie takes me and does them with me there. We had a pizza and wing party with Jim and Joy and Pat and Steve. 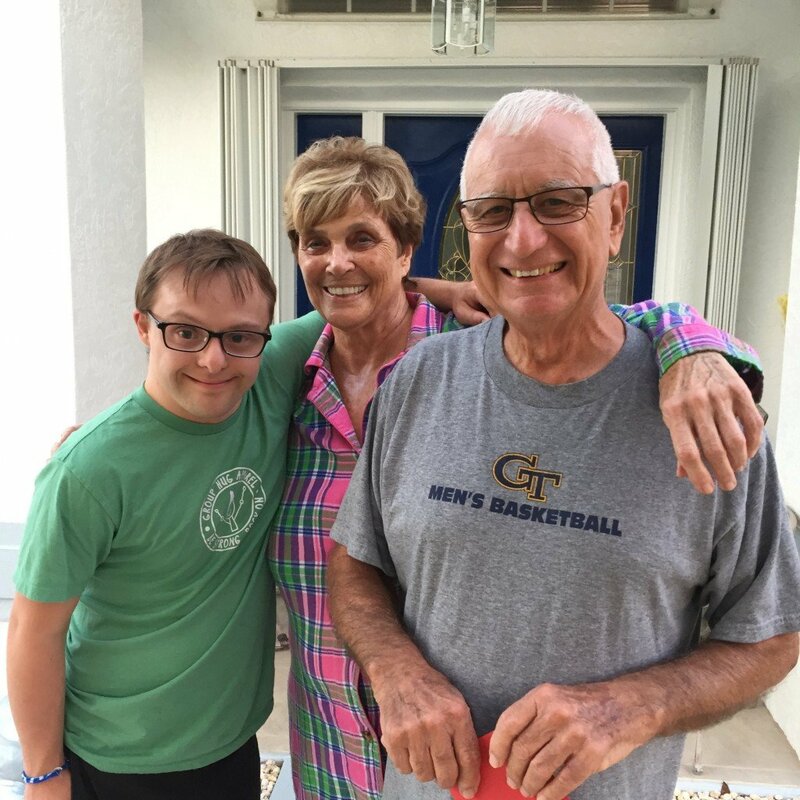 He drives his wife Pat around so I call him Uber Steve. Bob and Sue were there and my Grandma and mom and me. Pearl stayed in jail. She is my grandmas dog. It was her grate and not jail. I’m kidding. lol. She barks a lot. These are the some neighbours. 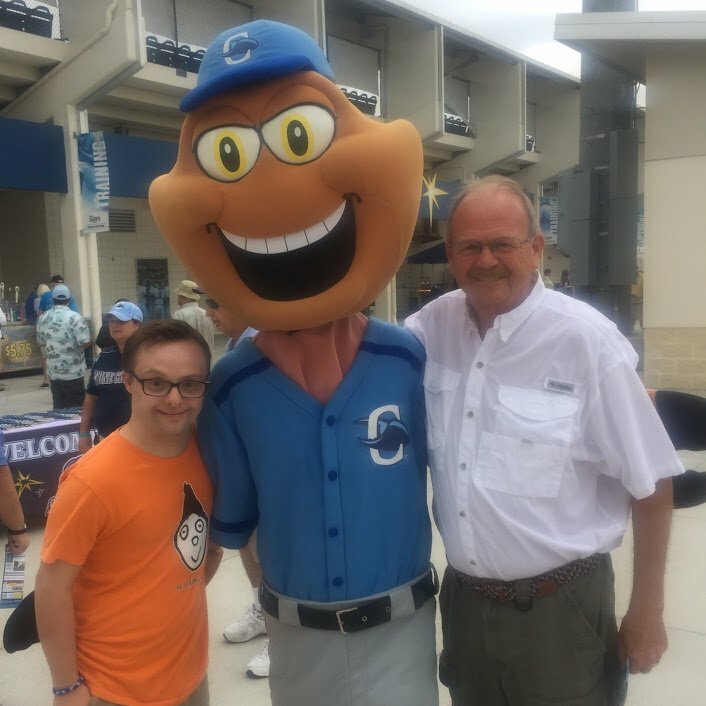 I went to a baseball game. 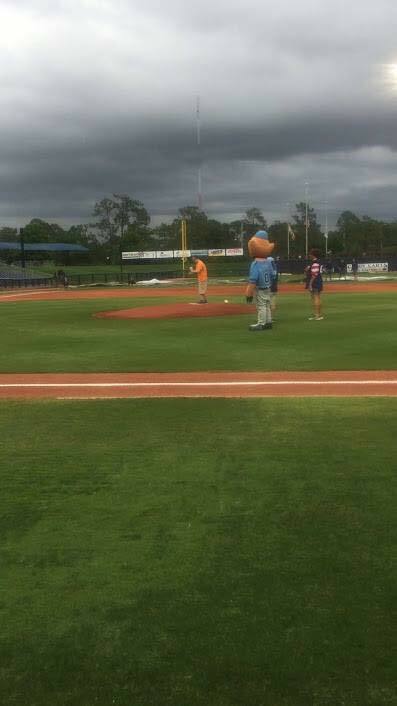 I got to throw the first pitch. I was so excited to do this. My grandmas friends Ray and Bambi surprised me with setting this up for a surprise. Me and my mom were really happy. I did a good job throwing the first pitch. Everyone cheered and clapped. Pat and Uber Steve took us to the game and we had a great time. I received a baseball signed by the entire team. This was cool. Thank you so much for doing this for me. I had a great time on my vacation. 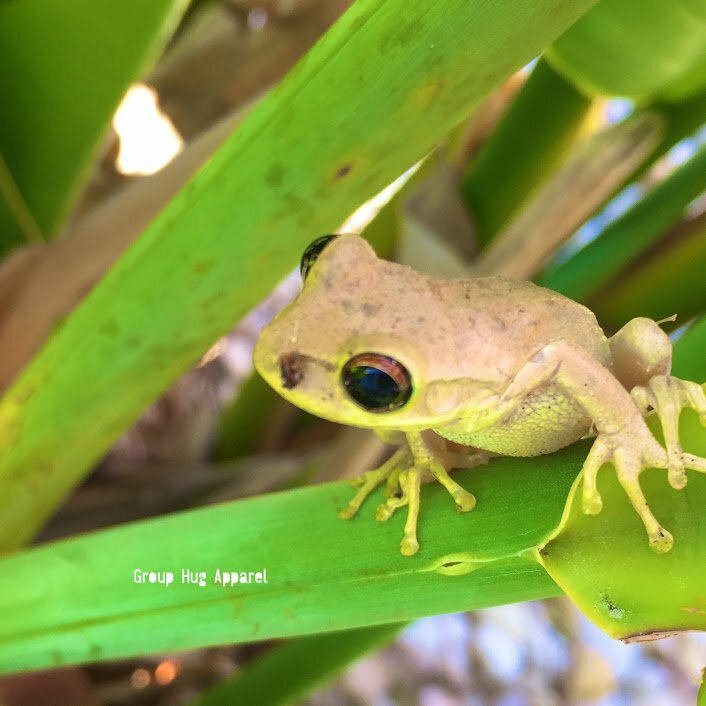 I hope you liked my post. 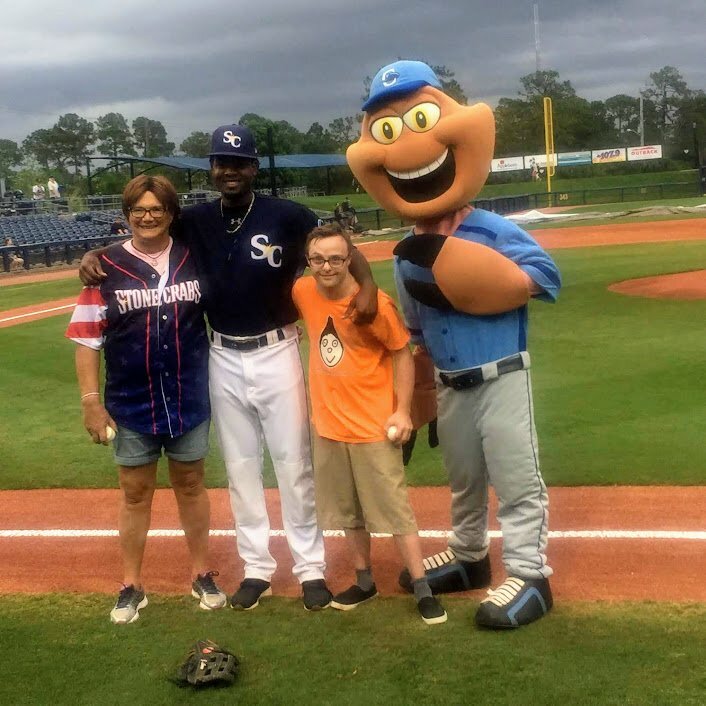 Wow, what a wonderful surprise it was when Andrew was invited to throw out the very first pitch during the Charlotte Stone Crabs vs Lakeland Flying Tigers Baseball game at Charlotte Sports Park. 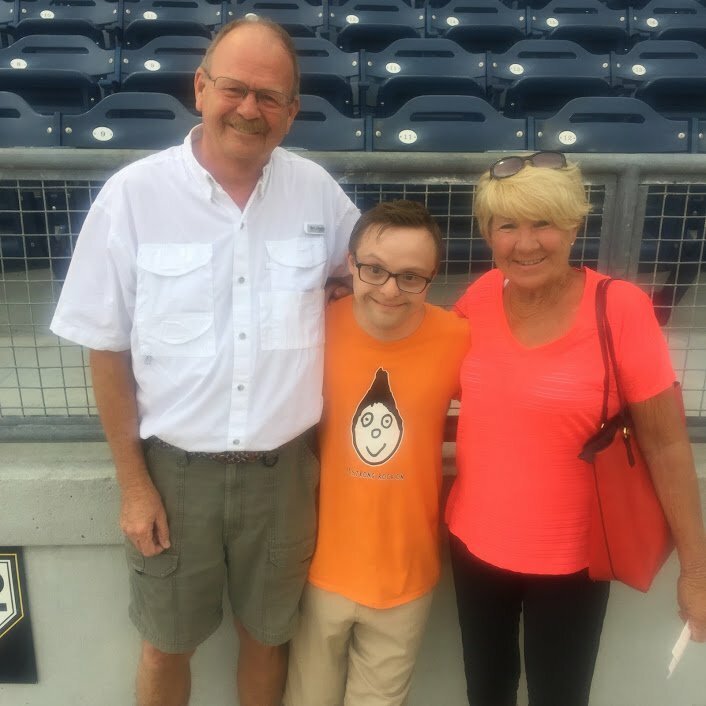 I think that our friends Steve and Patsy Armstrong who so graciously brought us to the game were as excited as he was. He was also amazed when he heard his name being called over the loud speaker…… Andrew Banar, please report to the home field dug out to prepare yourself for the pitchers mound. (Well, his name was called over the loud speaker to report to the dug out) 😉 He was on cloud 9. 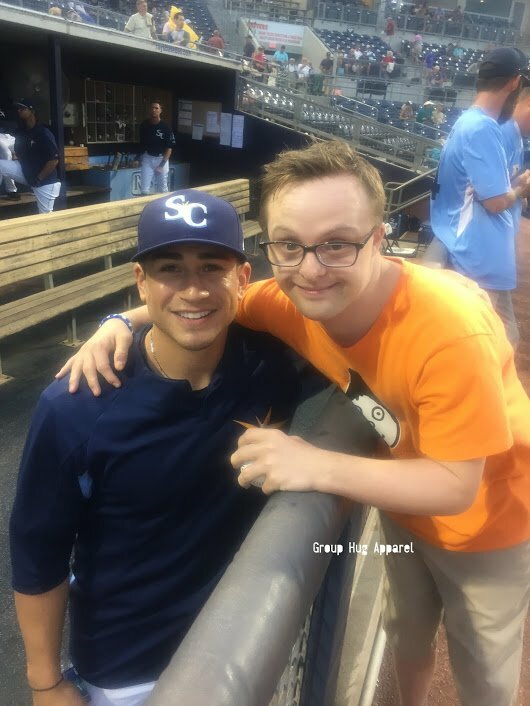 Thank you to Jared Forma the General Manager & Ray Rossi for making this happen and thank you to David Olmedo-Barrera for this awesome picture of you and Andrew. 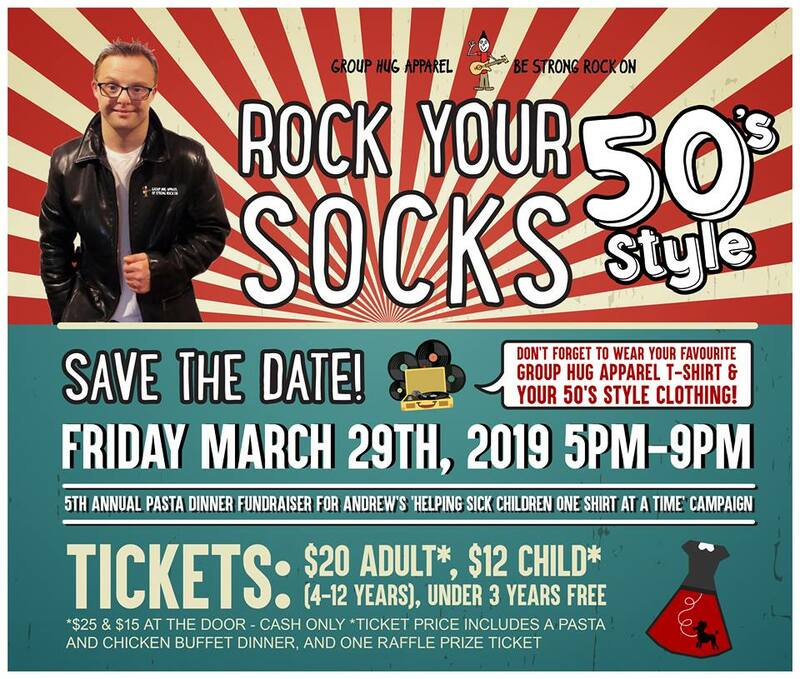 What a fabulous night we had at Andrew’s 4th Annual Rock Your Socks “Super Hero Style” fundraiser Friday evening. Wow, wow, wow! 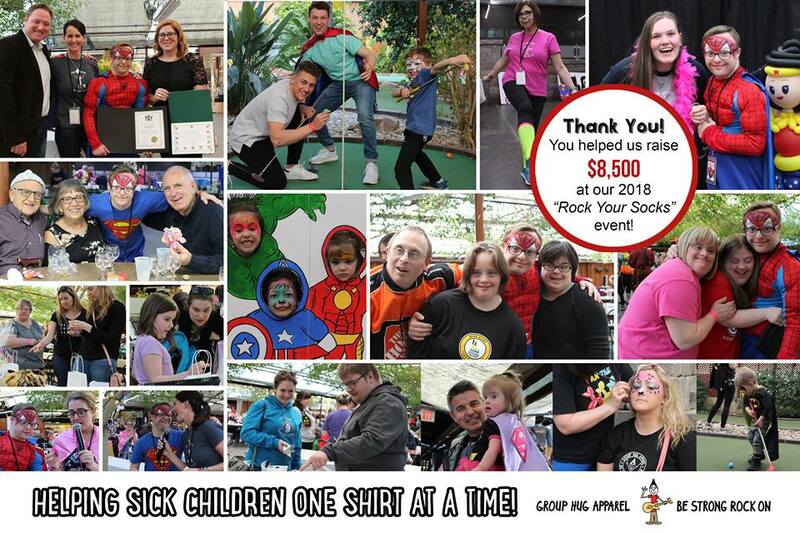 Thank you to everyone who attended, sponsored, baked and donated to this fabulous event for Andrew’s ongoing “Helping Sick Children One Shirt At A Time” campaign. With your generosity and support together you helped us raise $8,500.00 Friday evening AND with a to date total of just over $31,000 from our annual event AND a grand total of over $90,000 that Andrew has been able to donate to local children’s charities and his “Helping Sick Children One Shirt At A Time”. 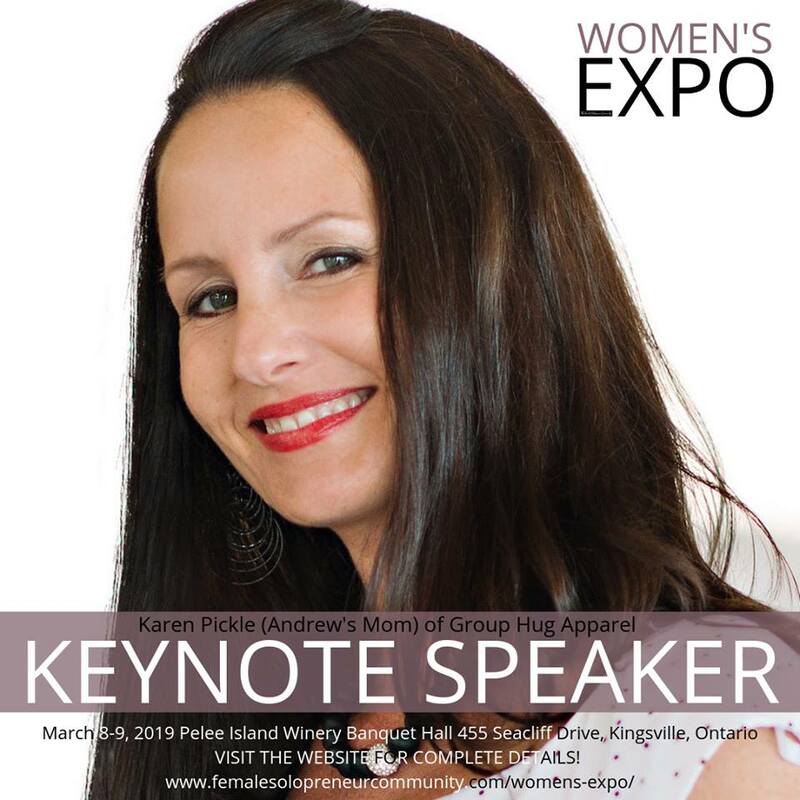 Thank you to our committee Tara Hickmott Brown, Suzanne Bonneau Brogan, Colleen Mackenzie Sandra Baumann-Stein Liz Baumann, Chantalle Thibodeau MacDonald, Debbie Bennett, Bianca Mouradian, Nancy Hickmott for helping to make our event run so smoothly. Tara, for your endless hours of help and for our friendship. Thank you to our photographer MacKenzie Mallen and Eric from Eyes On Windsor. The pictures turned out fabulous (we will post them soon). Thank you Bianca Mouradian for your our fantastic photo booth area and to LouLou for being our on the spot face painter. 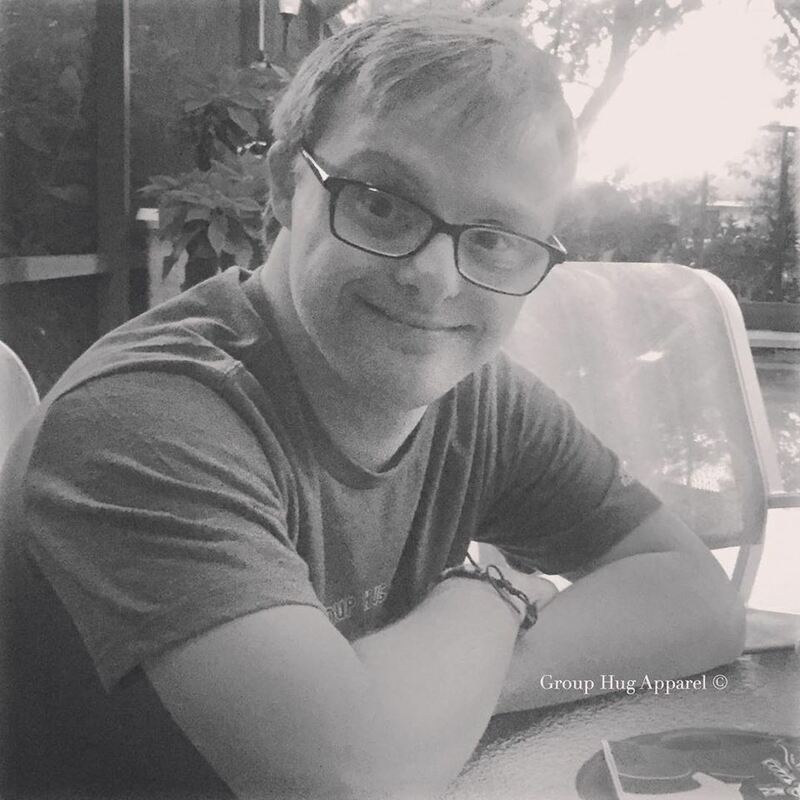 Please feel free to share our post and Andrew’s love with others. Never underestimate the power of kindness, its’ always around the corner. 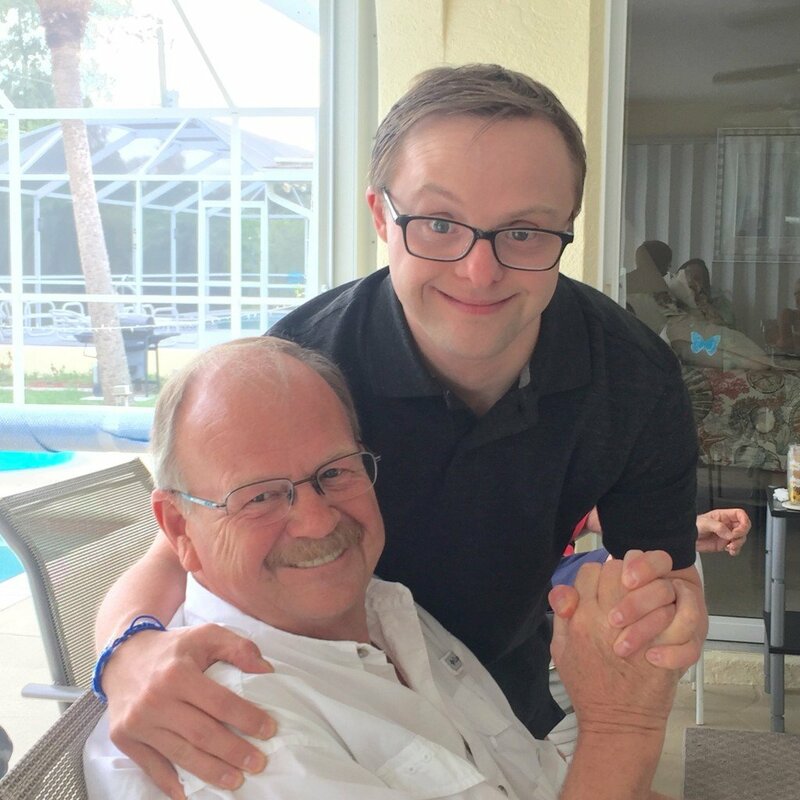 World Down syndrome Awareness Day is March 21st, and this is the day that we come together to celebrate people with Down syndrome, their abilities and their accomplishments. We do this by wearing our wildest and funkiest socks by showing that it’s ok to be different. 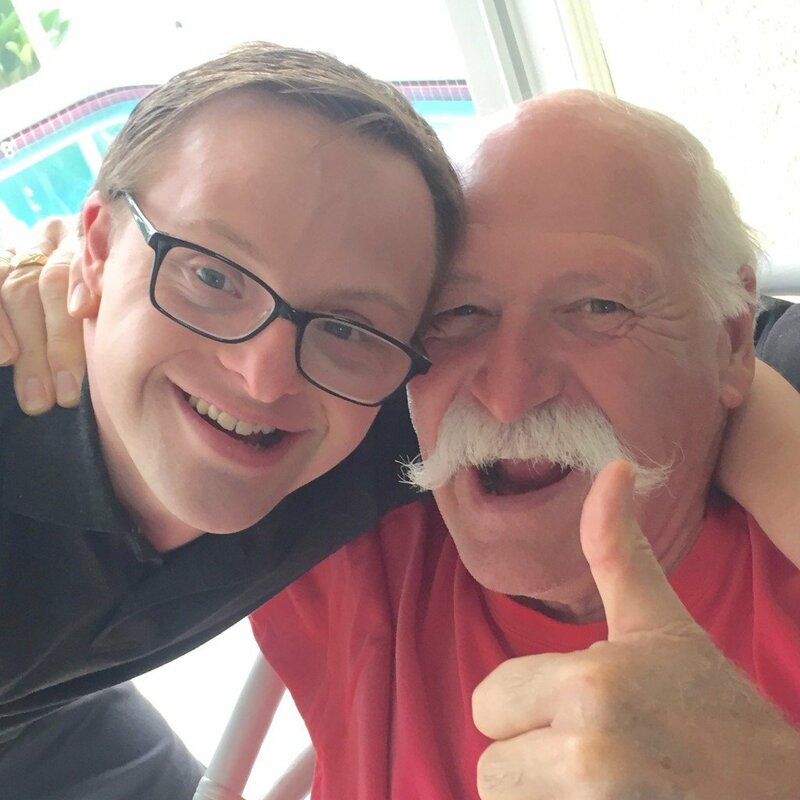 We were honoured to be part of this day in so many ways, not just because Andrew was born with Down syndrome….that’s a given, but because so many of you joined us around the world and in our communities. 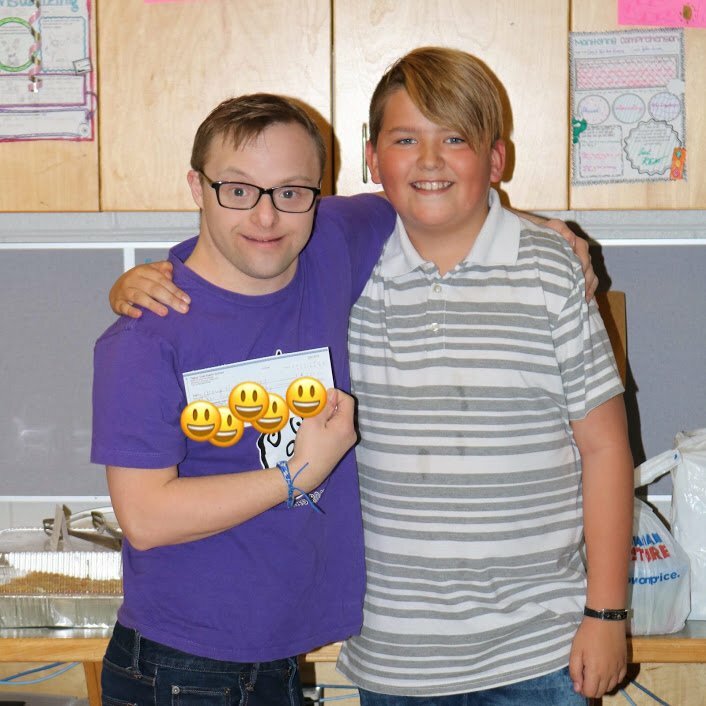 Andrew and I were invited to speak and share our journey at many schools this year. 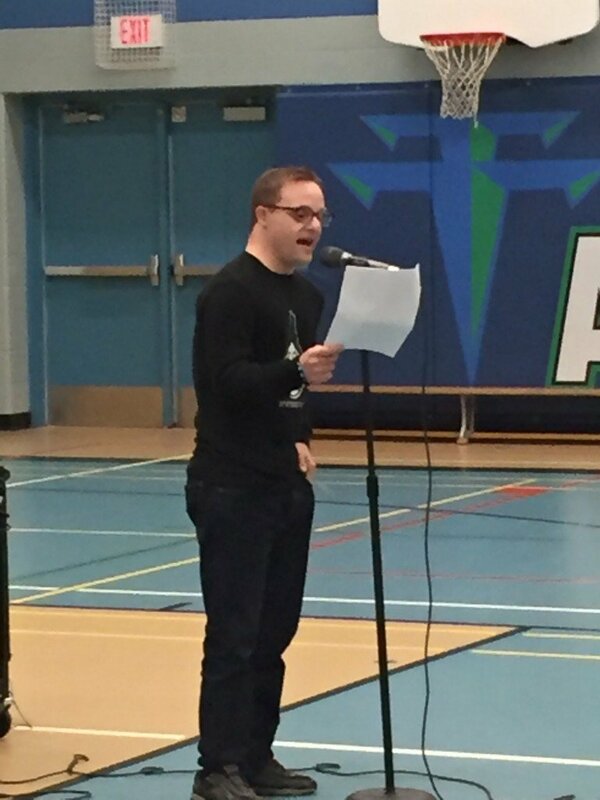 Andrew talked about his dreams, goals and achievements. 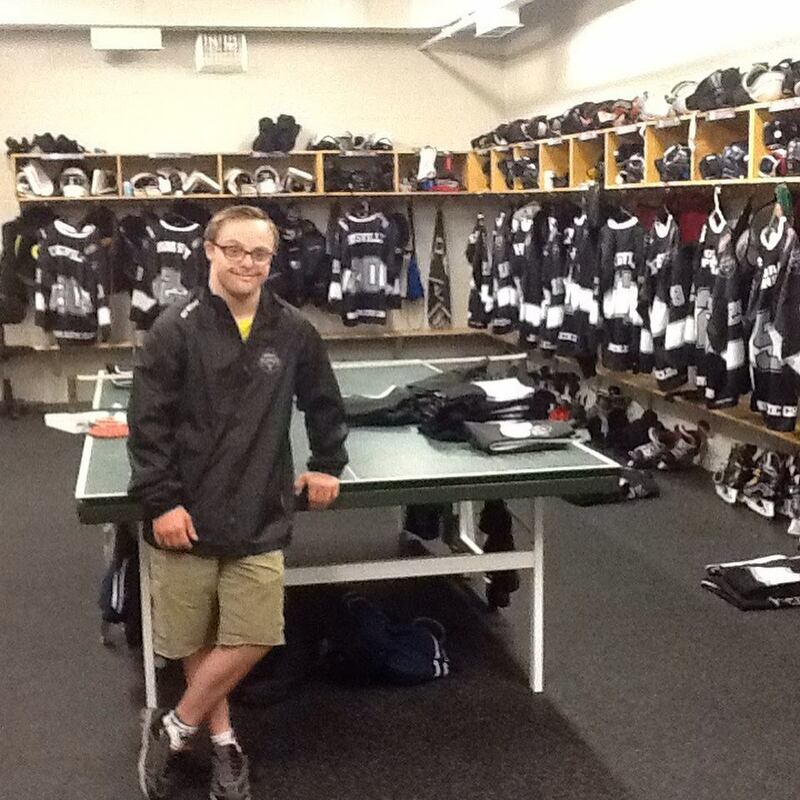 He also shared that just because he was born with Down syndrome that it doesn’t stop him from living a wonderful life. 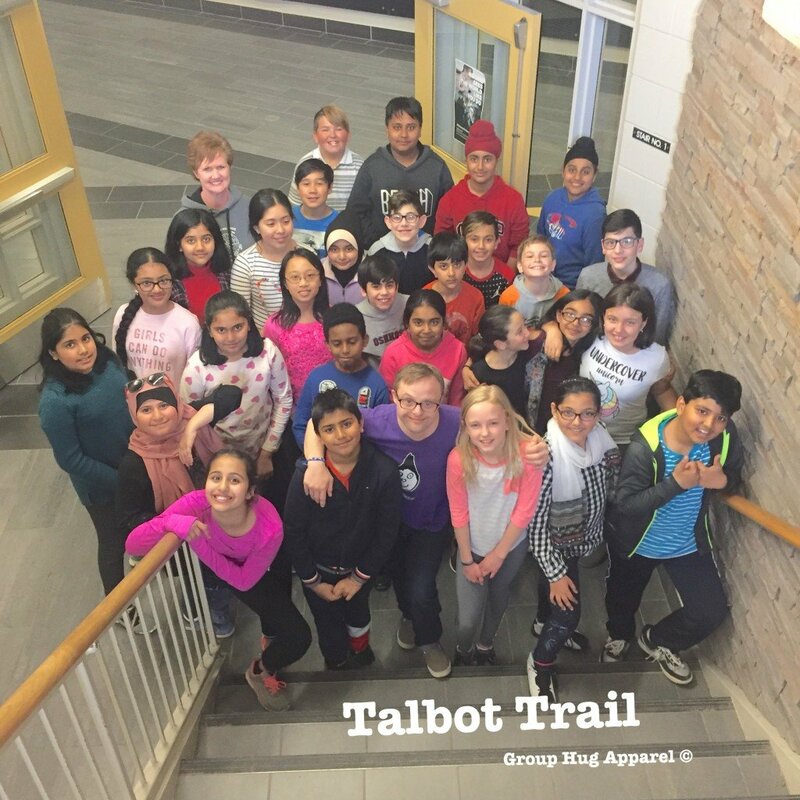 Talbot Trail Elementary was one of the many amazing schools that we spoke with, and just recently Andrew was honoured to receive a wonderful donation from their March 21st, WDSD celebration. 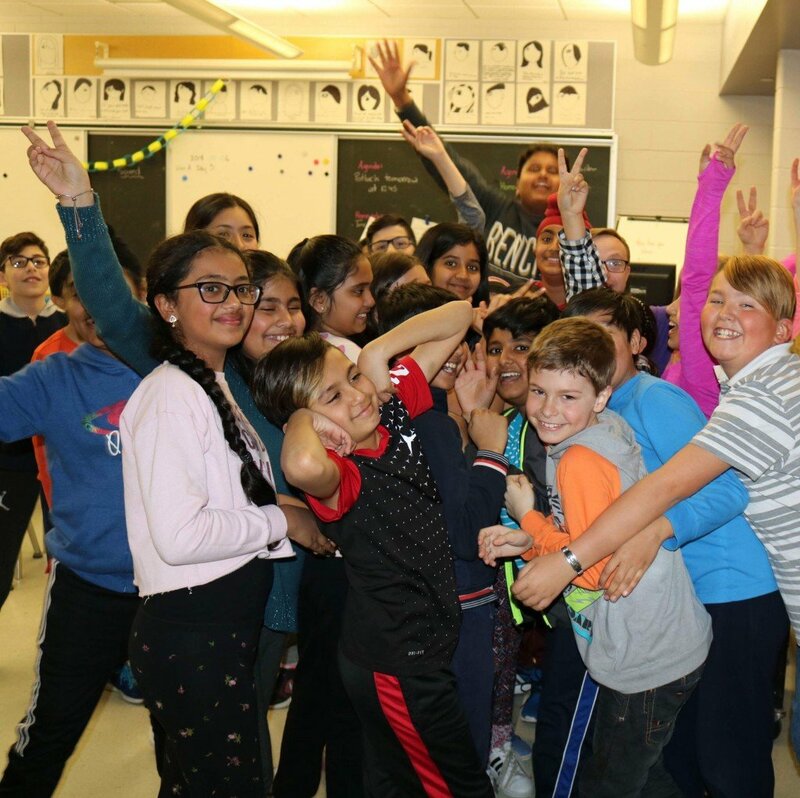 Students held a Toonie Drive and rocked their socks in support. Thank you for all of your wonderful support, enthusiasm and love. 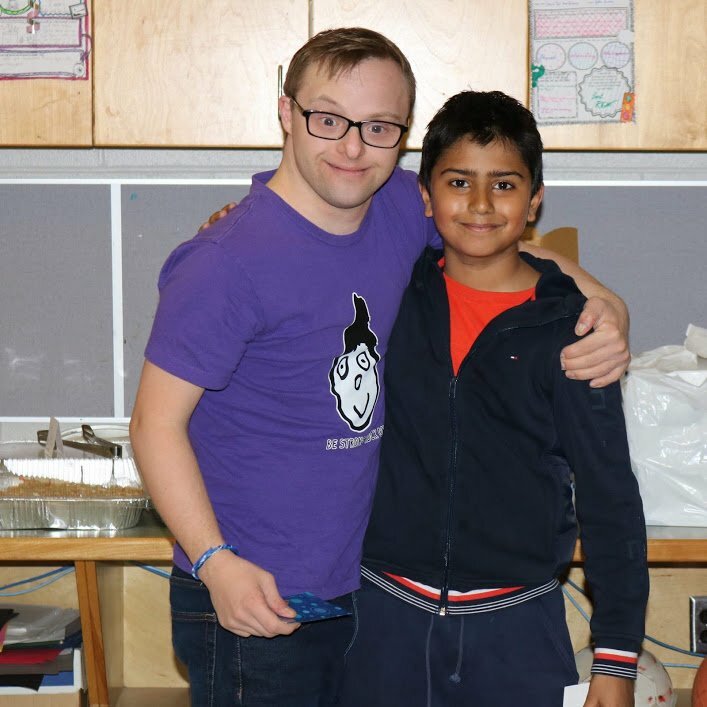 Your kindness will support many of Andrews not for profit programs within our community for people with intellectual disabilities. 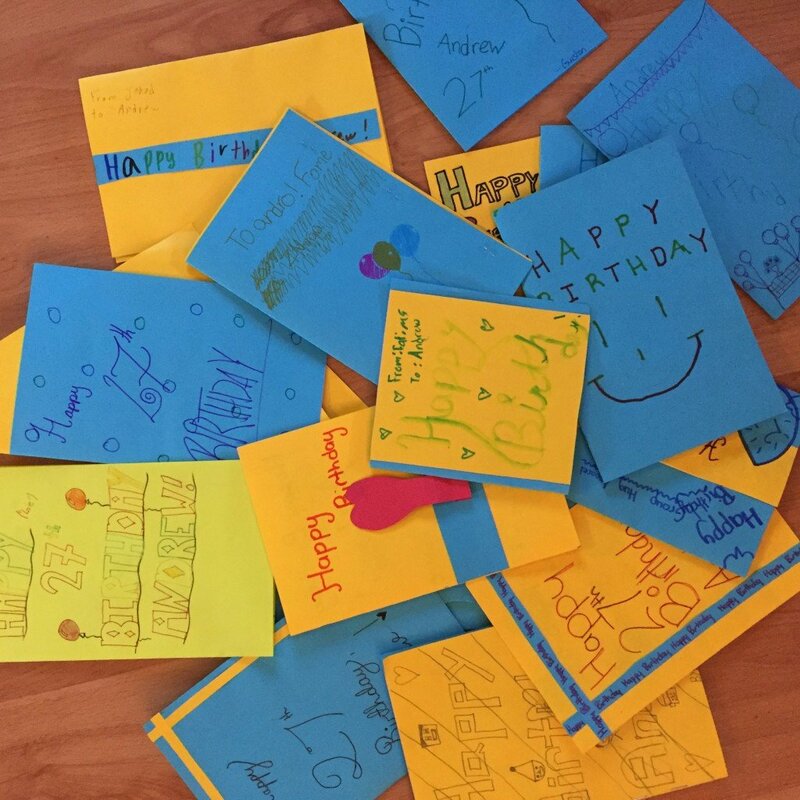 Shown here are Kathy Henry’s grade 5 students presenting Andrew wth a donation, Birthday cards and so much love. We are so very excited to make this huge announcement!!!!!! 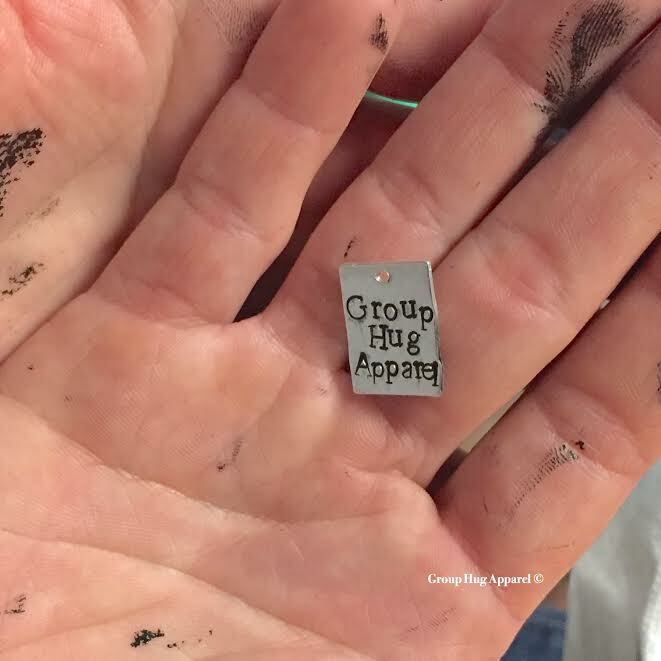 Christine Chittle, owner of Hazel In Pink Handmade Creations is collaborating with Andrew for an amazing fundraising campaign. Her motto is Keeping Hope Local! Now those are beautiful words don’t you think? When we “Keep Hope” anything can happen and it certainly has from her kindness and love. 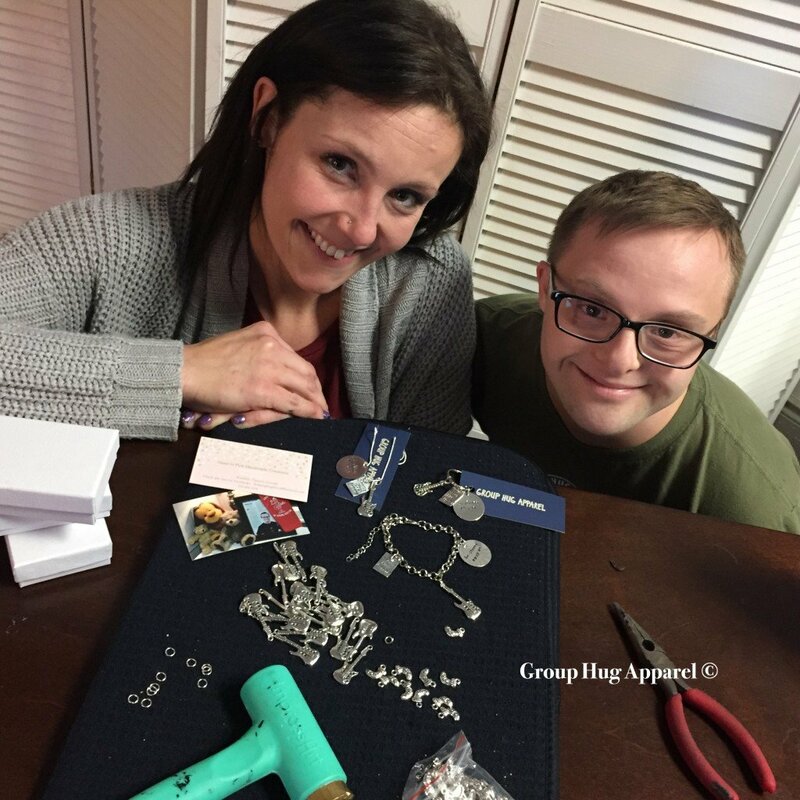 This friendship that has grown into a collaboration, started with Christine making a beautiful key chain for Andrew. 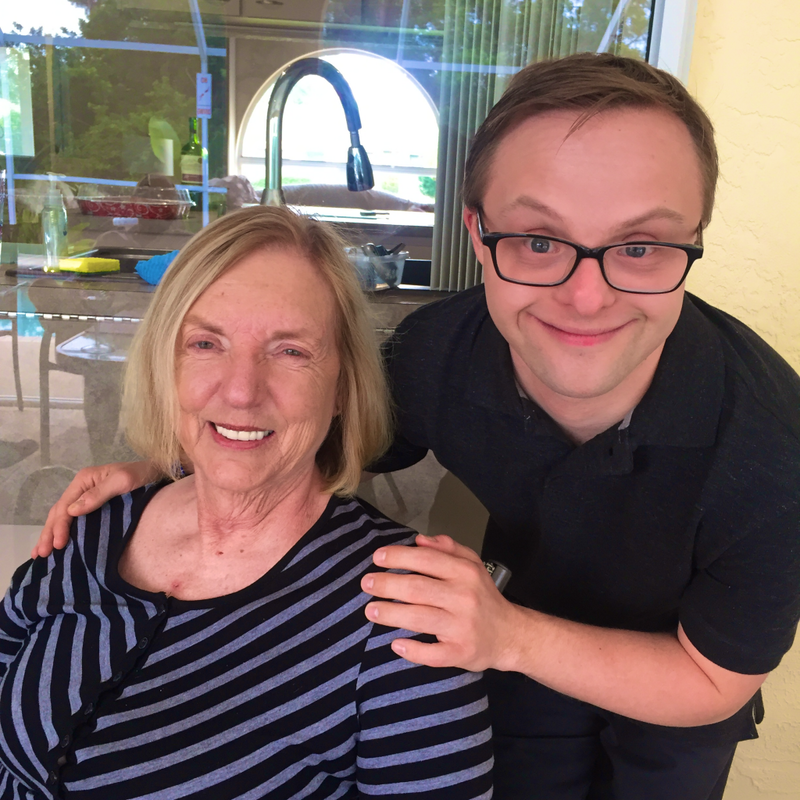 She knows that Andrew has many challenges in life BUT this never seems to stop him from achieving the things that he wants to accomplish. 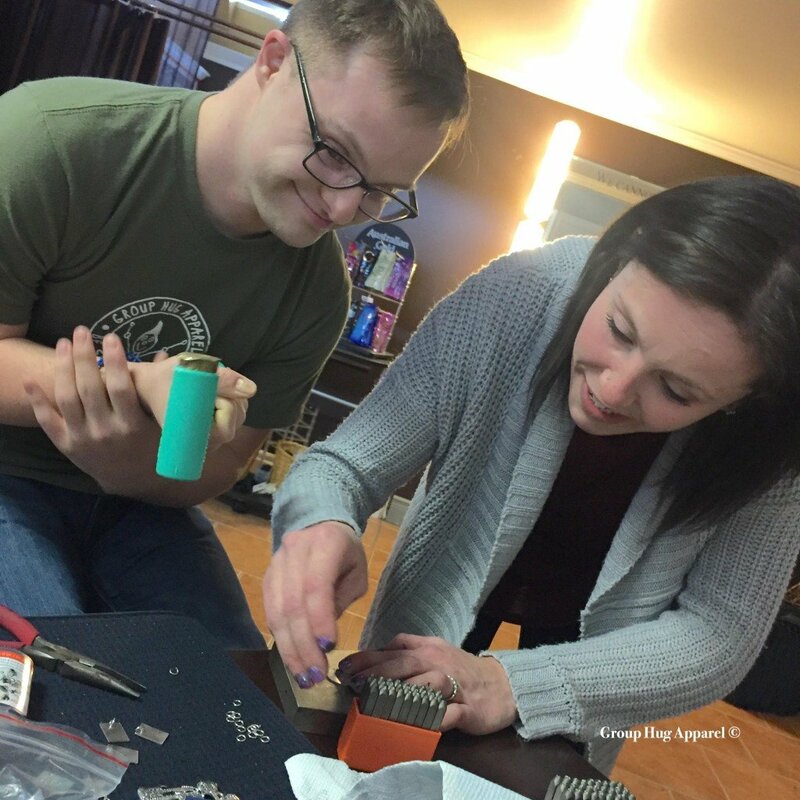 Christine loves Andrew’s “BE STRONG ROCK ON” way of thinking and wanted to give him a little gift that was a true testament of his life. How beautiful is this! 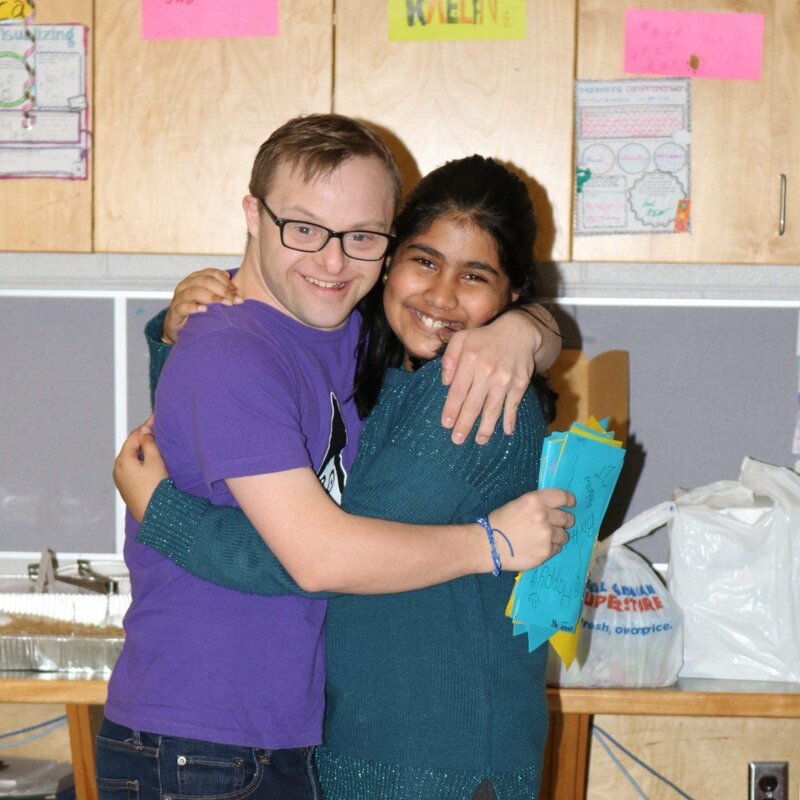 And from the kindness of one gift, together Andrew and Christine are creating some beautiful love to share with all of you. 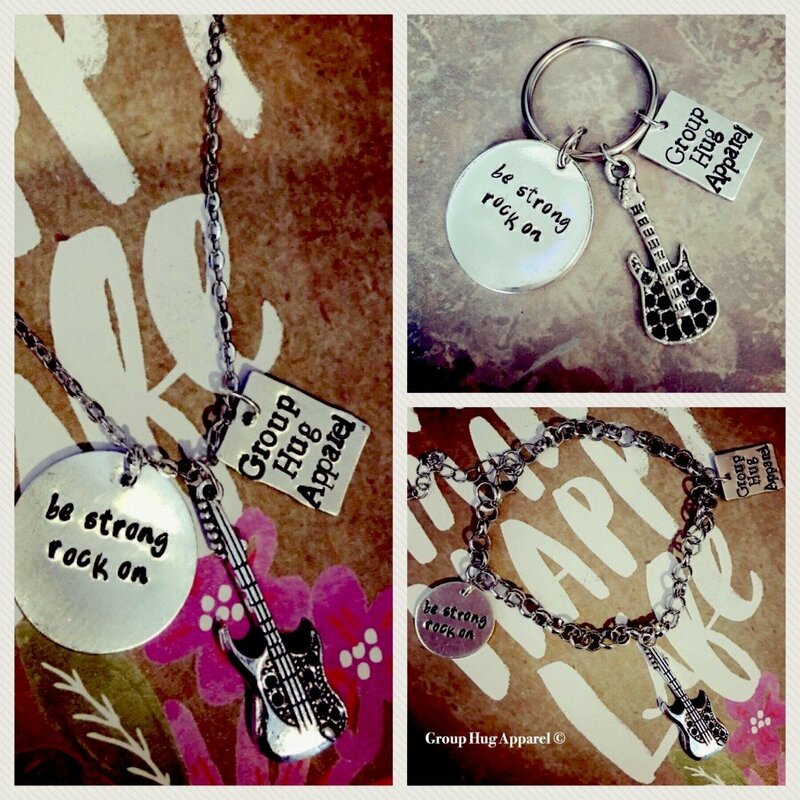 I am extremely proud to introduce our new Be Strong Rock On Key chains, bracelets and necklaces that Christine has created exclusively for Andrew of Group Hug Apparel. 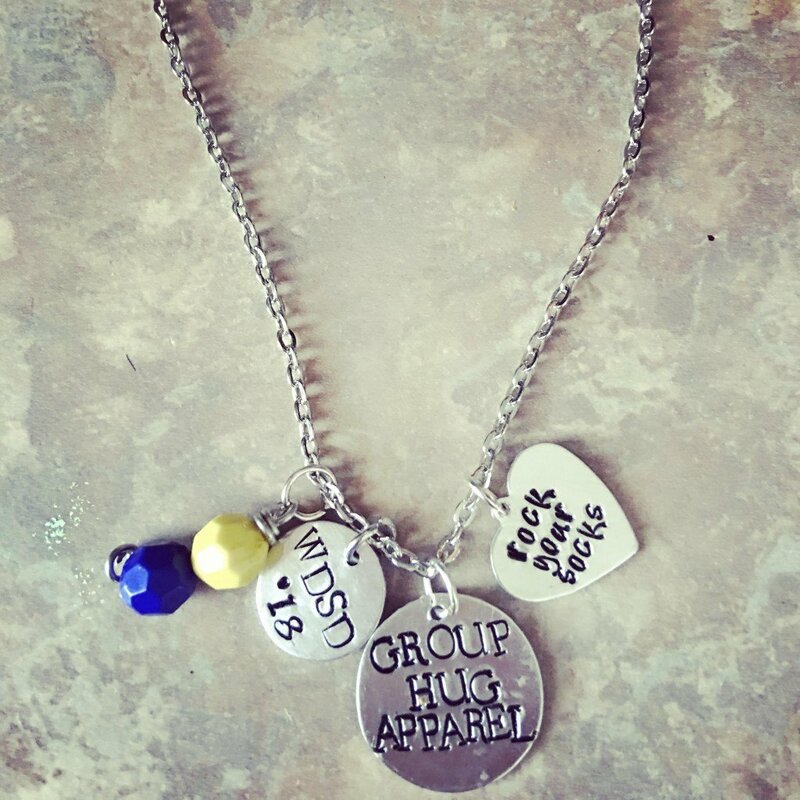 On every piece you will find a “guitar” charm and 2 hand stamped pendants. One with Andrew’s famous saying of “Be Strong Rock On” and the other with his awesome business name “Group Hug Apparel”. 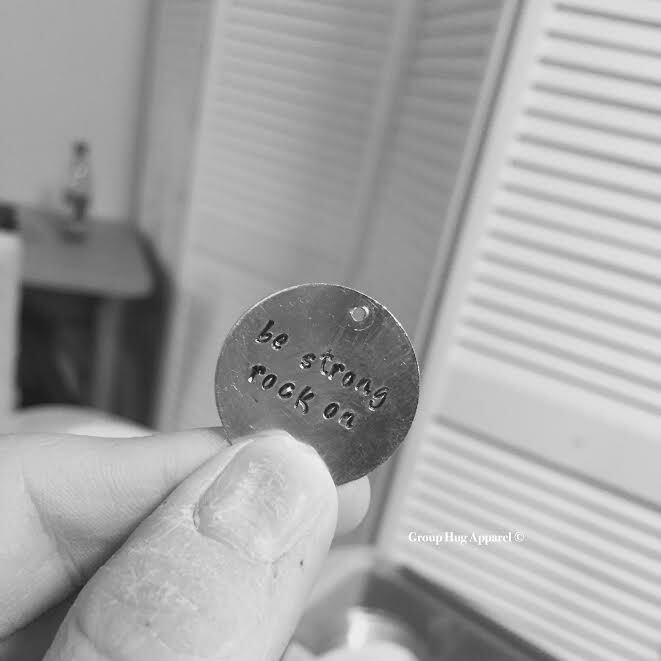 To order you very own Be Strong Rock ON key chains, bracelets and necklace, please check out our website jewelry link OR Hazel In Pink Handmade Creations website and FACEBOOK page here. 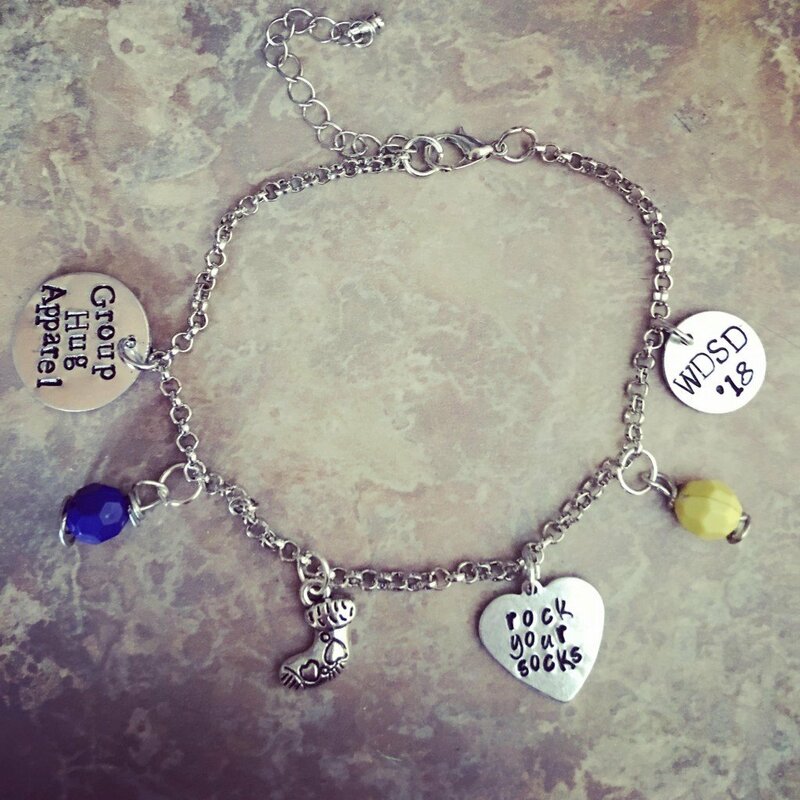 $5 from every key chain and $6 from every bracelet and necklace sold will go toward Andrew’s Helping Sick Children One Shirt At A Time campaign. 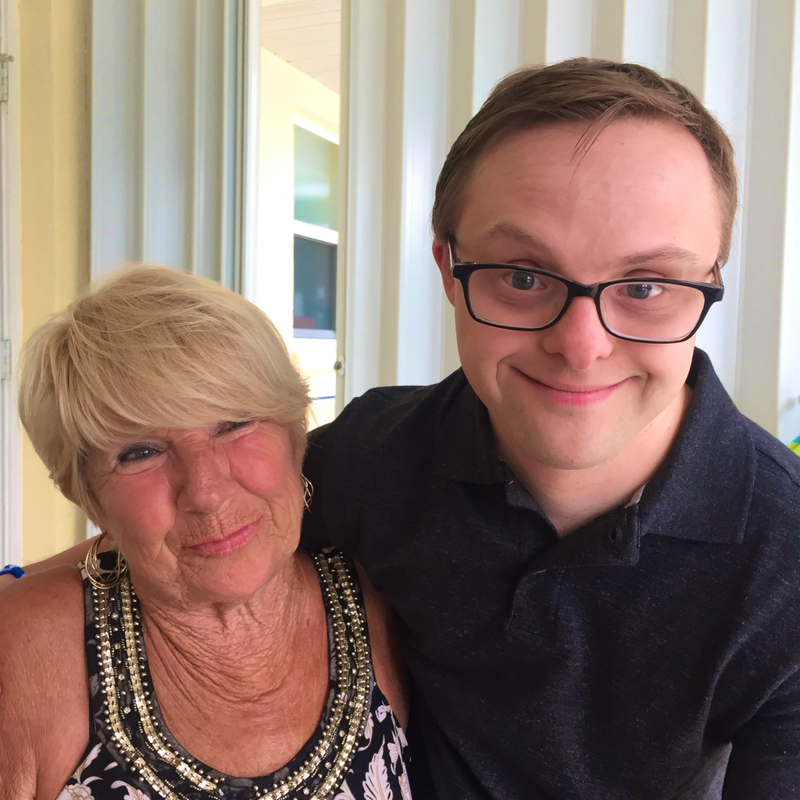 Andrew is bursting with excitement and is so very thankful for Christine’s kindness and love. 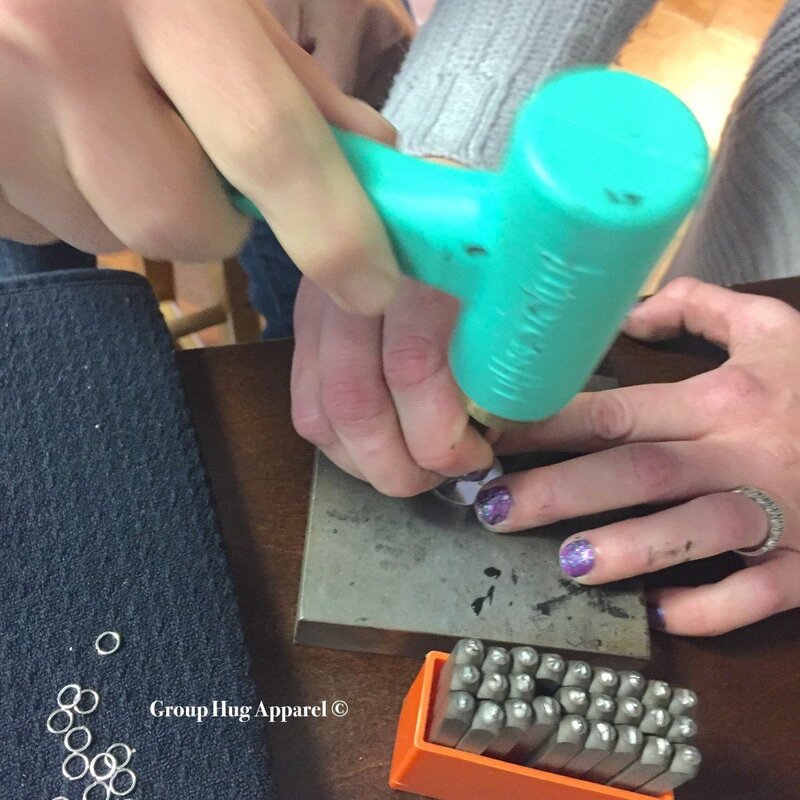 Check out how much fun these two had creating each piece. 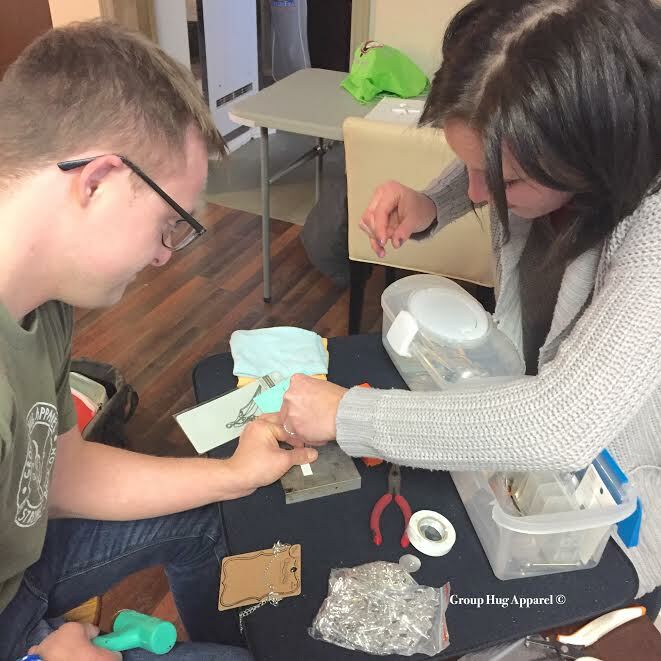 Andrew learning how to hand punch each pendant….. and not his fingers. 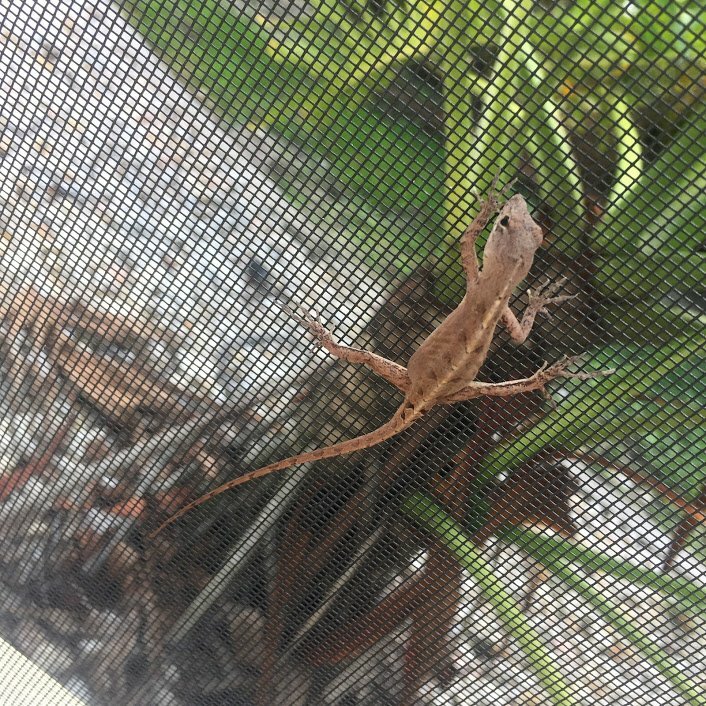 First try and he is pro. Working on the next piece. 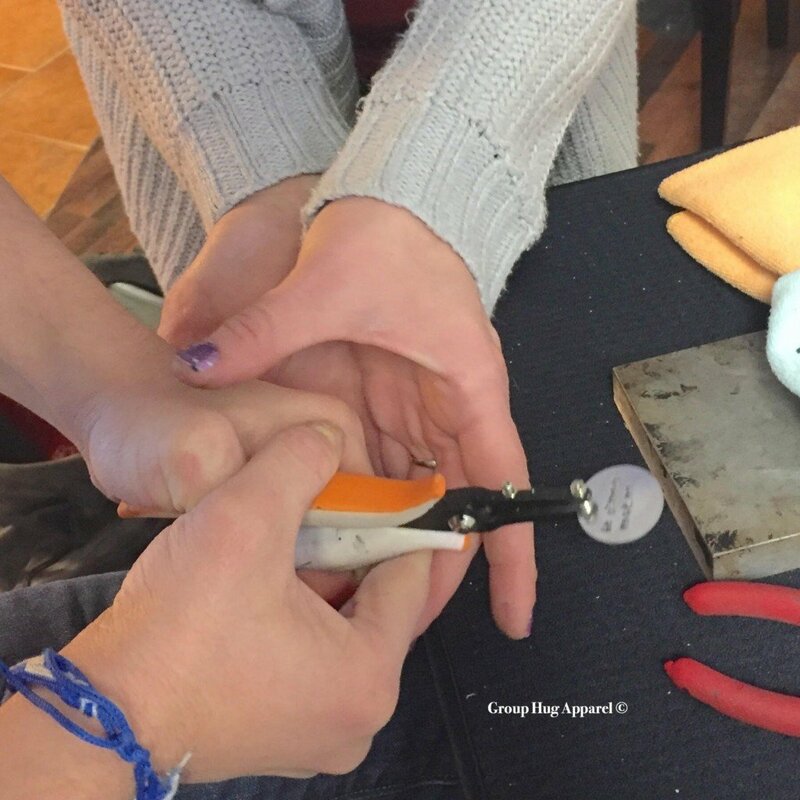 Adding the hole to attach the pendant to the piece. Christine and Andrew with some of their finished creations. 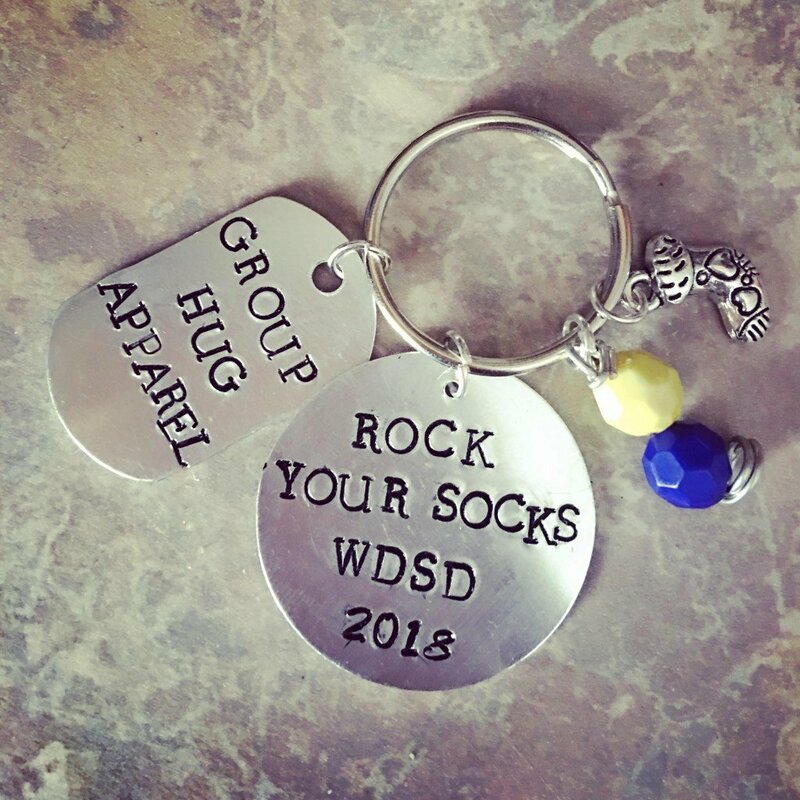 Key chains, necklaces and bracelets. All available for you to purchase here. What do you think? I love it when people help me celebrate Down syndrome Awareness. I get invited to speak about my life all the time. I like speaking about my dreams and my goals. I like to share how together with my mom i can achieve my goals. This is important to me and my family. They want to see me live a great life and I want that as well. 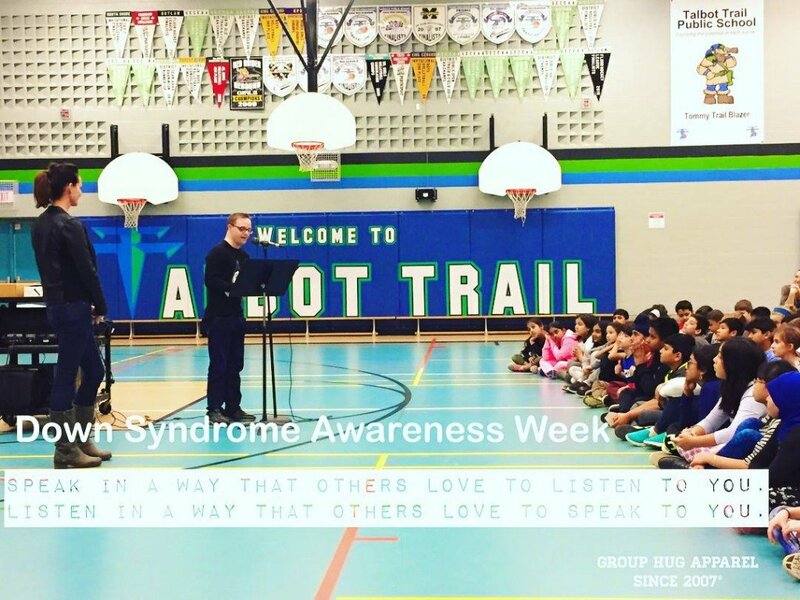 This is me talking to students at Talbot Trail School during Canadian Down syndrome Awareness Week (November 1 – 7th) about my life. It was really nice meeting everyone. 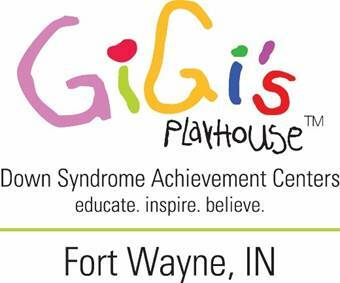 Now we are getting ready for World Down syndrome Day. It is on March 21st and is celebrated all around the world. 3-2-1 The 3rd month on the 21st day. I am asking everyone to help celebrate it with me. Can you do that? 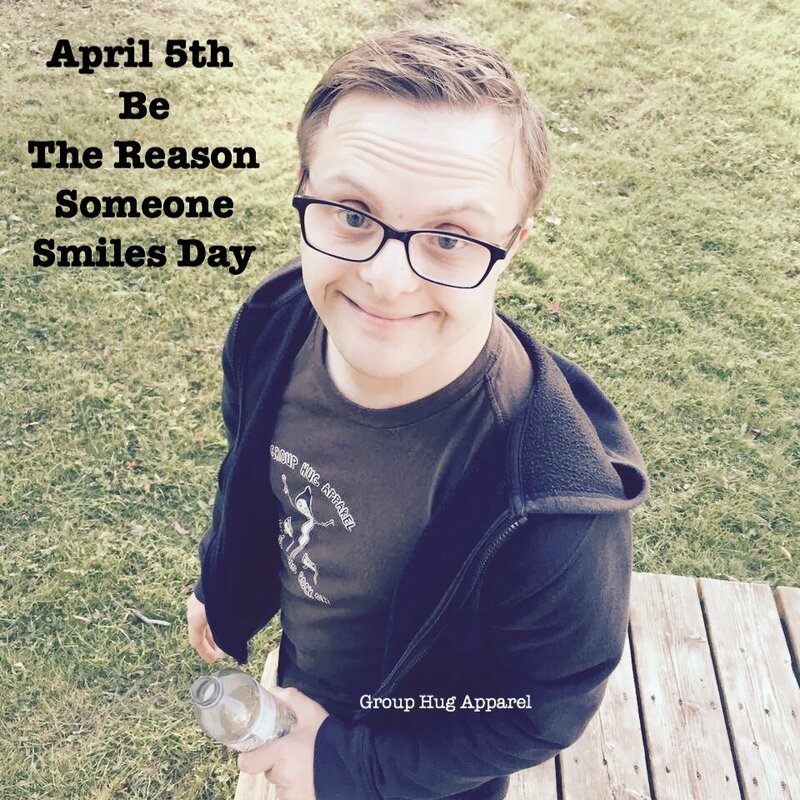 This is a chance to spread awareness by celebrating people with Down syndrome, their abilities and accomplishments. 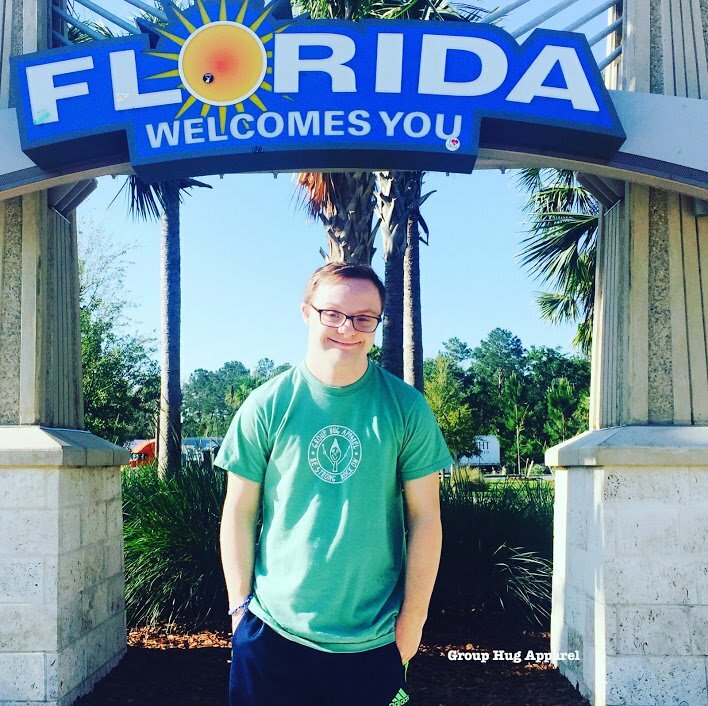 If there are students in your school who have Down syndrome like me, celebrate what they can do. I know that sometimes I may do things different than others but that’s OK. My mom see’s everything that I can do as potential and not being limited. I may take longer to figure things out, I may need a lot more modifications, I may need to do things more than once, but if I am not given the opportunity how will you know if I can do things. Sometimes you many not recognize that we can do things like others and sometimes you may not have patience to let us do things because it’s just easier to take care of it yourself. 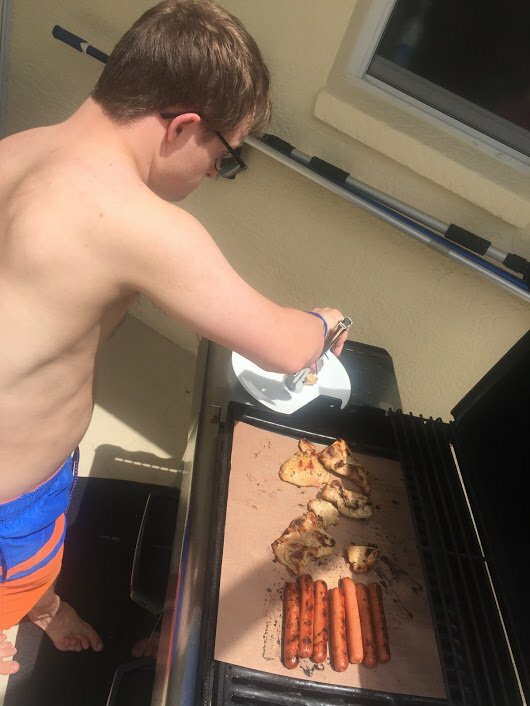 Please let a person with a disability try to do it first, it may take more time but let me try to be an example of what an individual can do if given the opportunity. 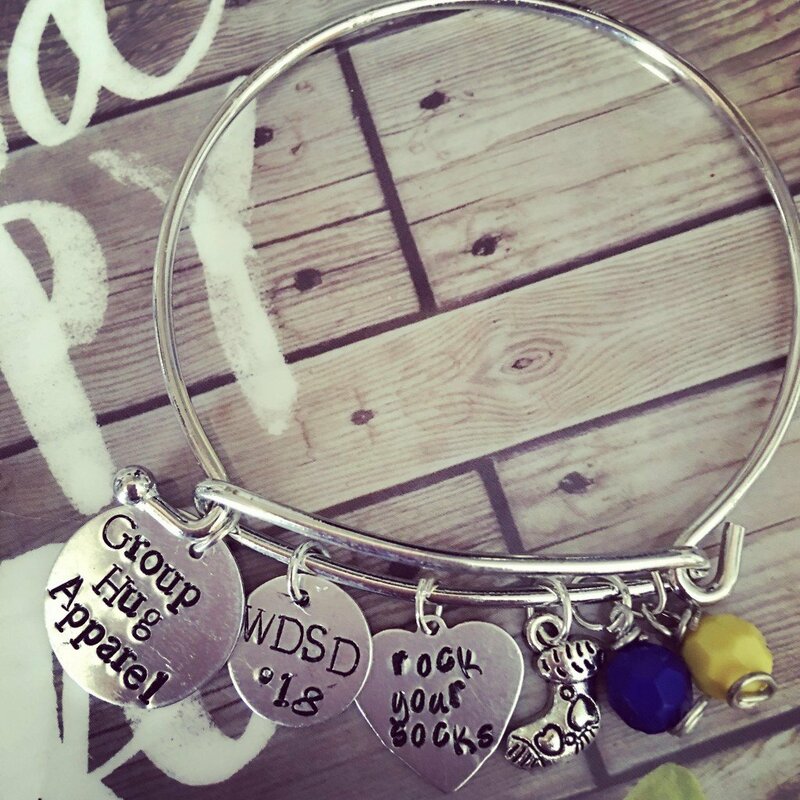 Some ways to celebrate: Have a blue and yellow day. 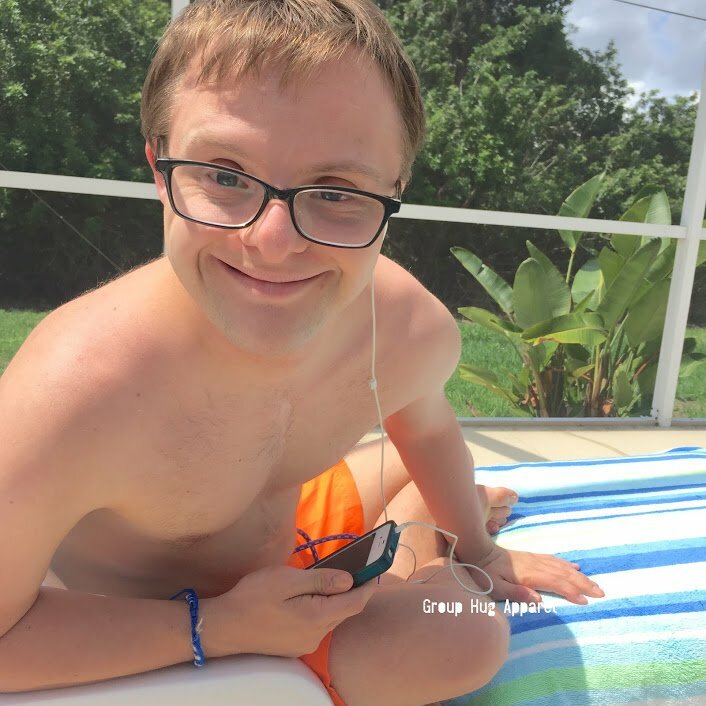 These are colours that represent Down syndrome Awareness. You can order a blue or yellow tee here with one of Andrew’s designs on them. Wear you wildest, brightest, funkiest socks. 1 sock.. or even 3 socks for 3 chromosomes. 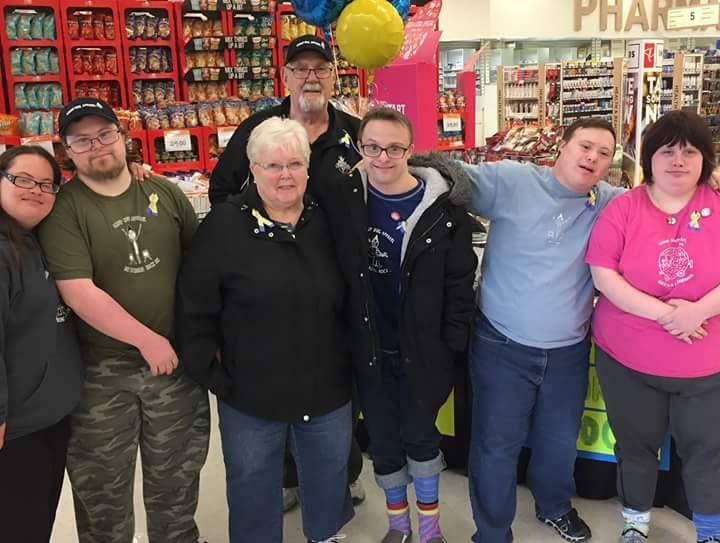 3-2-1 Maybe even turn your celebrations into a fundraiser and donate the proceeds to programs and activities that support people with Down syndrome. Feel free to contact my mom Karen for more information about programs that I have started locally for me and my friends. 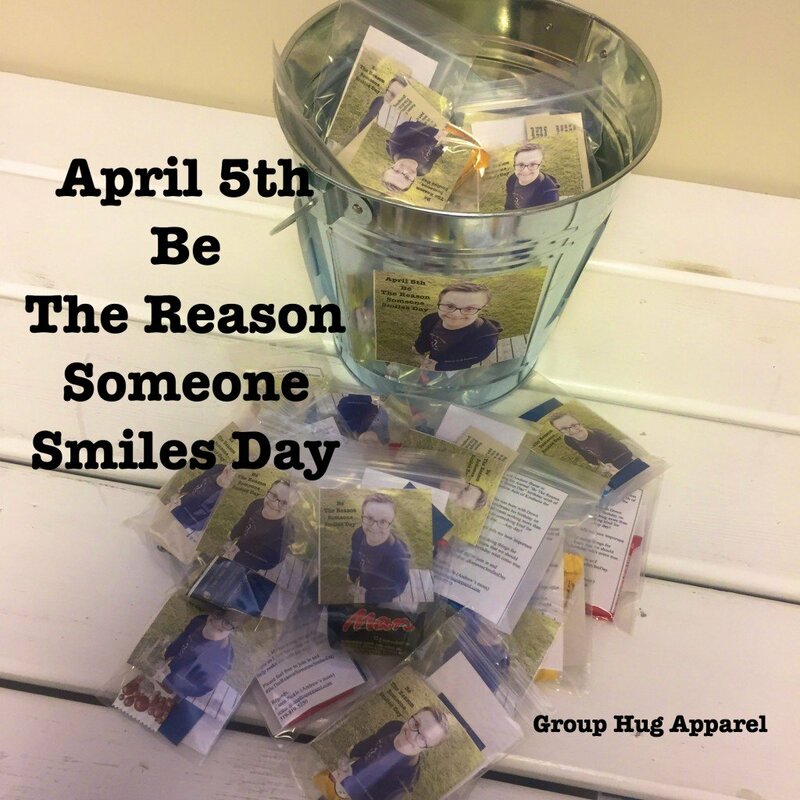 (grouphugapparel@gmail.com) or by calling her 519-819-5250 Thank you for celebrating with me.